At The Compassion Center, we will teach you how to sit when meditating. Unlike some forms of meditation, we do not place strict rules on how to sit while meditating. The most important point we make to first time meditators is that you must be comfortable while you meditate. Image used with permission of Dharmacrafts.com. When most people who are new to meditation think about how they will sit during meditation, they think of the cross legged sitting position. 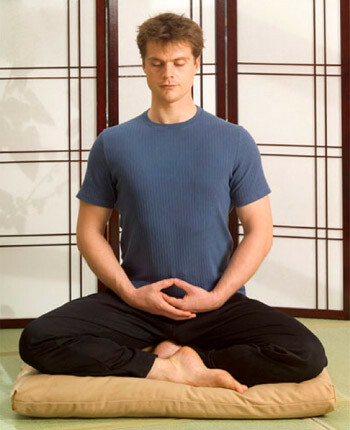 This is the most famous of all positions and the sitting position that is pictured most often in relationship to meditation. However, it is also a position that many people have difficulty getting into and maintaining for a prolonged period. First time meditators will be happy to know that using a chair to sit in while meditating is perfectly acceptable. The preferred way to sit in a chair for meditation is to sit on the edge of the chair, not with your back against chair’s back support, and to sit erect. As sitting on the edge of a chair may be difficult for some, using a cushion between your back and the chair’s back support is perfectly acceptable. For those that cannot sit in a chair, lying flat on a cushion is also perfectly acceptable. As there are many who have lower back issues and cannot sit in chair for a prolonged period of time, using a full-length Yoga cushion is a very viable way to get comfortable and meditate. There are various props sold by places that sell Meditation and Yoga supplies. This includes kneeling benches and various types of cushions. If you have any physical challenges, please visit a website like DharmaCrafts to see what they can provide you to make meditation sessions as comfortable as possible. We invite you to visit The Compassion Center located in Staten Island, New York, to learn and practice Meditation.